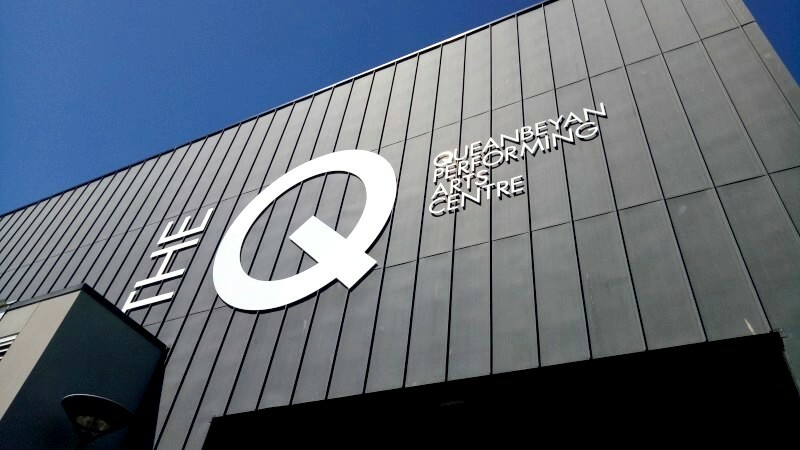 Last Sunday was another National Capital Orchestra concert, this time at TheQ, that lovely and clever little theatre at Queanbeyan. Sixty-or-so players performing a Sibelius tone poem, The Wood Nymph, Glière Horn concerto and Dvorak Symphony no.5. The tone poem was an odd thing, telling the story of Björn, a handsome young chap who catches the eye of the spirits who then lure his to a Skogsrå (wood nymph) who seduces him, leaving him in lifelong despair. So says the program. 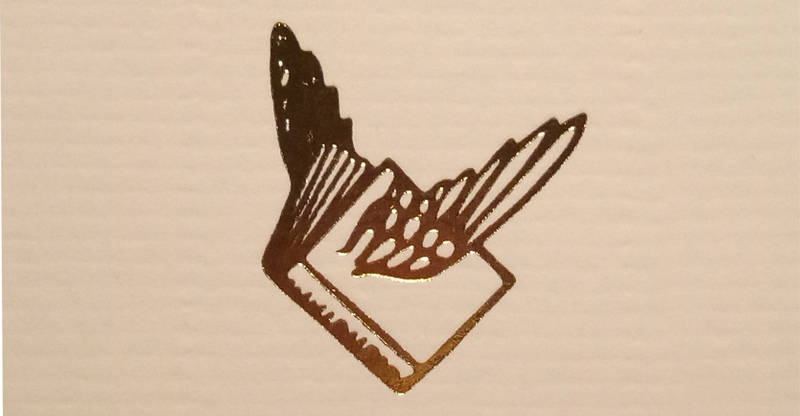 In practice, it was long, unchanging passages of accompaniment and occasional flourishes, but I liked it. 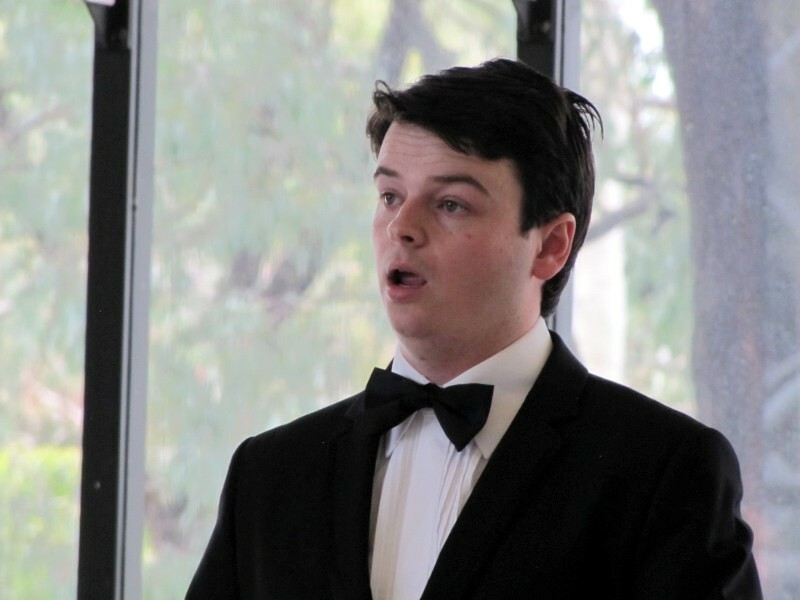 Then our guest, Rob Gladstones, a product of Canberra but now a principal horn player for the WA Symph Orch. 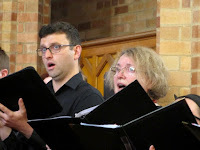 This was a romantic piece with some very odd and tricky lines which (I liked but which were very slippery) and plenty of accidentals, not least otherwise infrequent double sharps. We'd prepared without Rob and hadn't heard his feature solo prior to the performance, so it remained fresh on the night. Some seriously impressive horn playing - someone said over 4 octaves. Then the symphony, Dvorak no.4. It's well known for the lively third movement. A nice, interesting work with some fast and even furious lines but not the trickiness of the Gliere. One other feature of the performance was the bass section, now counting 4 players: Matt, Roger, Geoff and Eric. But what of the day? Set up from 11am (lugging risers and chairs), warm up from 12.30pm, then lunch and return by 2.30pm for performance at 3pm. We hung out in the local pub and not alone in that. What a good day! Here are a few pics of a day in the life. National Capital Orchestra performed Dvorak, Gliere and Sibelius at TheQ under Leonard Weiss (conductor) with soloist Rob Gladstones (horn). 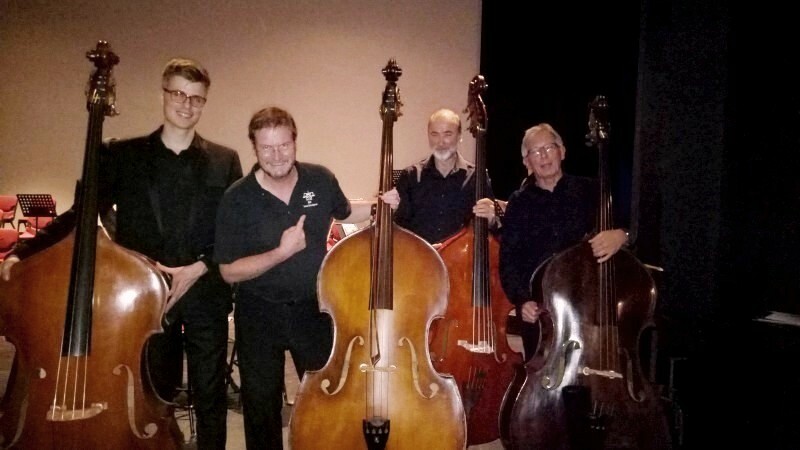 The bass section comprised Matthew Gambrill, Roger Grime, Geoff Prime and Eric Pozza (basses). More chalk and cheese. I've heard of Margaret Legge Wilkinson for some time, but I'm only just now writing her up for CJ. She played for a lunchtime concert at Wesley. The chalk was Bach; the cheese was Messiaen. Both fabulous musics, but as diverse as they come. 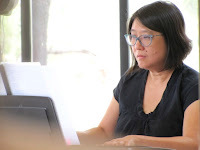 Margaret played the Bach with considerable consistency so a little variation goes a long way, except for those final phrases where lots of rit is not too much, and just occasionally a little variation within the piece. There are terms for this that I've only discovered recently in baroque context . One is "French style, slightly inegale" (in this case, for how you treat a row of quavers). Another was "tripletised" (for a string of dotted quavers with leading semi-quavers). I thought maybe some dotted notes in one Prelude and Fugue may have been more tripletised, but that's interpretation. But the regularity of all this makes great demands on the player, to pull off the multiple contrapuntal lines with sometimes tack-sharp consistency. The Messiaen was different. Not that arch-consistency of repetitive rhythms, but more open in rhythm and harmony. This really was delicious music. 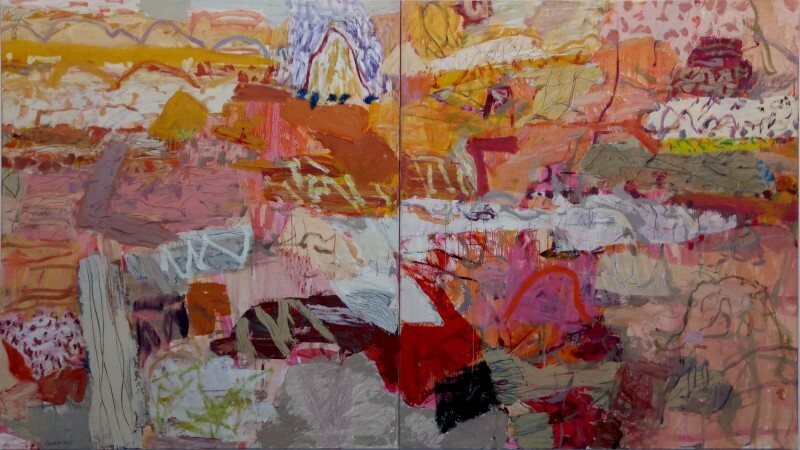 Perhaps I should especially say colourful here (which it was, in spades) given the instructions from the score that are expressed literally in colours and were read out by Margaret: oranges and violets and grey; mauve to start, moving through silver, gold to a Prussian blue ending. My recall of suggested colours is inexact but the impression isn't. Interpretation expressed literally in colours. I felt Margaret was more at home here with the lightness and prettiness and subtle movements of harmony and various mixed techniques of this C20th music, if only on this day. Nice. BTW the music played was Bach Well Tempered Clavier, Book 2, Preludes & Fugues Fmin, Gmaj, Gmin and Messiaen Selections from Preludes for piano. Margaret Legge Wilkinson (piano) played Bach and Messiaen at Wesley. 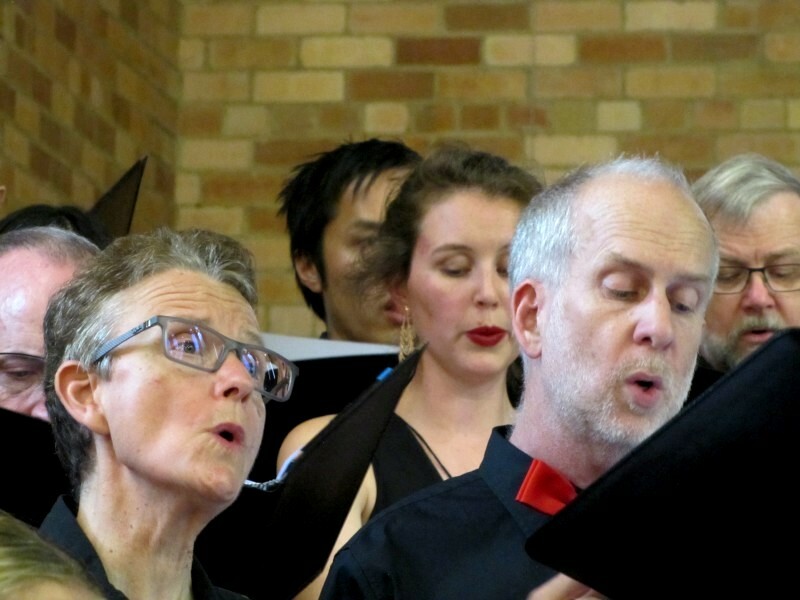 This was an odd concert by the Australian Haydn Ensemble in a number of ways. They mix big with small concerts and this was a smaller one, a quintet. But 2 cellos, a string quartet with double cellos? It's a strange arrangement, but there's music written for it, so it's valid and interesting and strangely satisfying. The two cellos took different roles at different times. 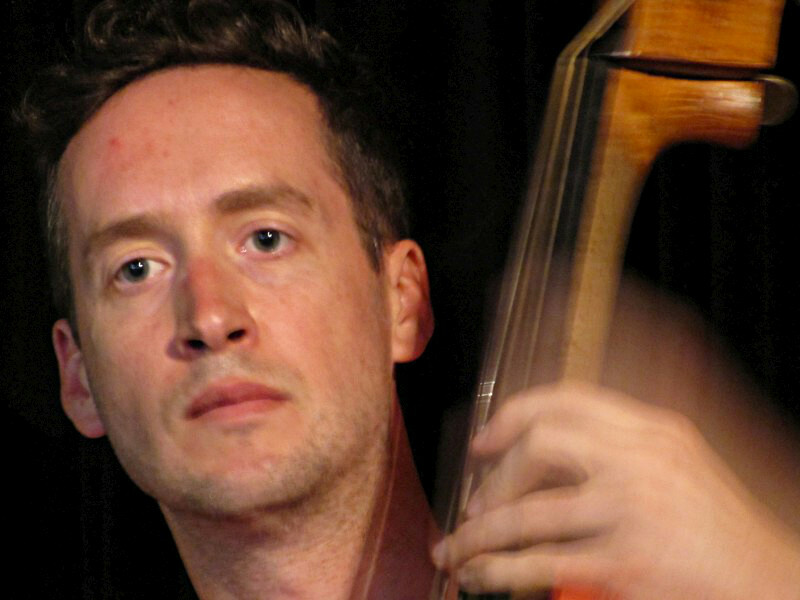 One might be playing a bass line while the other plays melody, or unison with viola or even a melody part to respond to a violin or they might just play a line in octaves. So the first item of unusualness was the lineup. Second was the program. Mozart and Boccherini are common names on a baroque program but the works here were different. The Mozart was Fantasy in F minor, K.504 rearranged for "mechanical organ" and it was a strange thing that held little similarity to the ordered, often light, sometimes humourous music of Mozart. 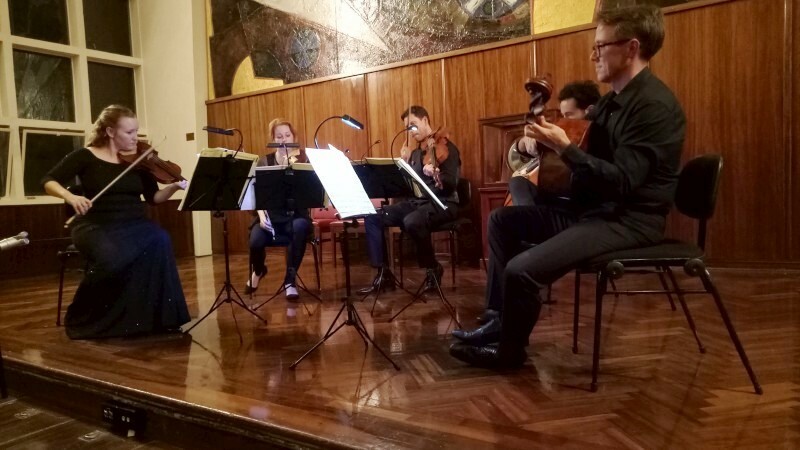 The first Boccherini, String quintet op.25 no.6 Amin, was Spanish-influenced and understandable enough in the baroque context but his op.30 "Night music of the streets of Madrid" was anything but. 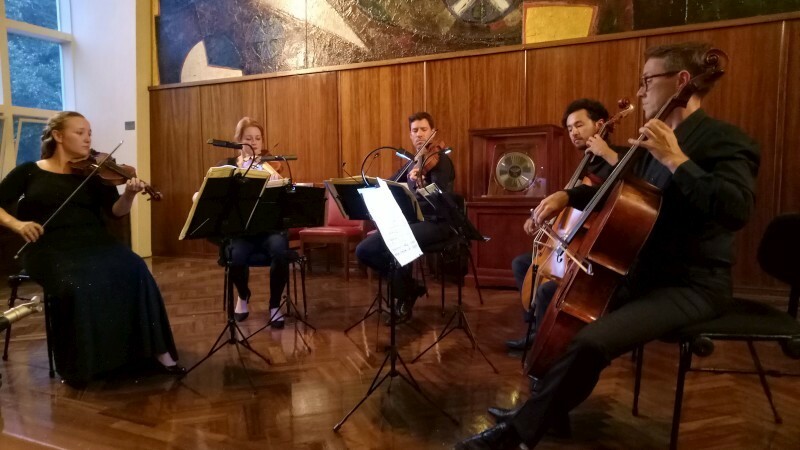 It was written by Boccherini to be performed only in Spain (the Italians are a proud people!) and not to be published outside. But it was, so we have it. It's a programmatic work, with parts named Ave Maria Bell or Soldier's drum or Minuet of blind beggars or Retreat. It tells a story. It also plays the part. First up, a strong rhythmic passage on one note from first violin; a little later, strummed chords on cellos held on laps like guitars (apparently required by the score); still later, a mad viola bowing on one note representing drums and a very challenging bowing over all four strings on violin 2, repeated a few bars later (I was amused to see Caroline's relief after carrying off each of these!). All strange, not particularly contrapuntal or otherwise baroque-like and very resonant of Spain and Flamenco. Thus oddity of this concert. Another, perhaps, was Cambini, a lesser-known baroque composer with a satisfying but fairly uneventful piece. Good to hear music like this occasionally, rather than just the masters: it gives perspective. So, an divergent but satisfying concert, for the notable playing, the humour and interesting journey, but especially for the strange but informative program. 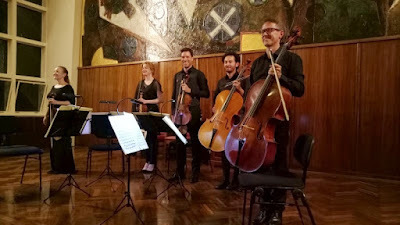 This night the Australian Haydn Ensemble comprised Skye McIntosh and Caroline Hopson (violins), James Eccles (viola) and Anton Baba and Daniel Yeadon (cellos). It's not often you fall in love with music. This was one time. Michelle Nicolle was playing with her backing trio at Smiths. Miro came across and sat in. This is with the best. A delightfully easy and soft backing band, firm, clear, decisive but gentle and unassuming. Flighty but perceptive guitar solos. Easy bass, understated but indicative. 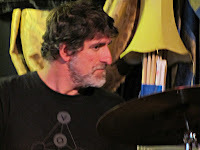 Ronny on drums, soft and understated at back, but beautifully precise when he dropped in a fill or a roll or whatever. But not too much; never too much. And Michelle. The obvious front line of the show. A strong voice when called for, hugely detailed and precise and inventive, but never forced, always at the service of the song. The song was mostly Ellington and Stayhorn, so it was massively worthy song. 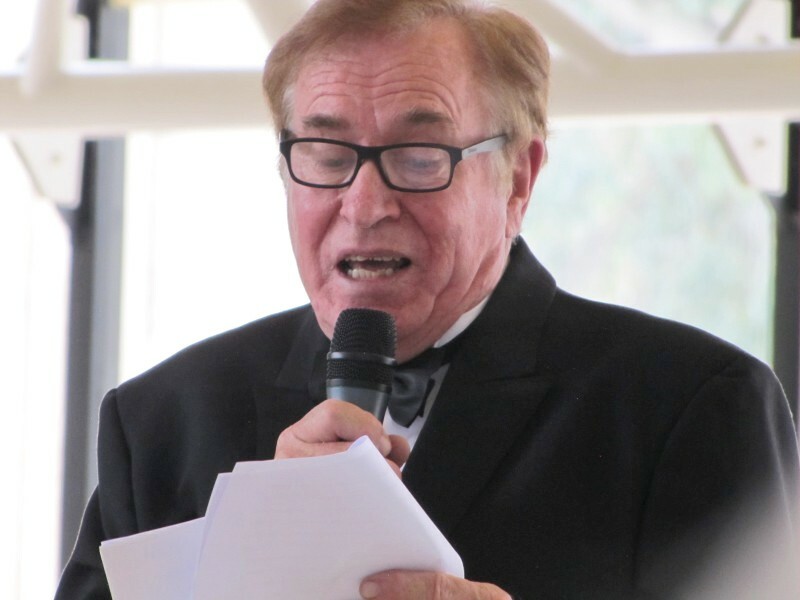 And a lively, personal, humourous presence, joking of touring or recounting transcriptions. I think it was for A flower is a lovesome thing that she transcribed the intro verse from Ella and is ever avoiding sounding too much like her. 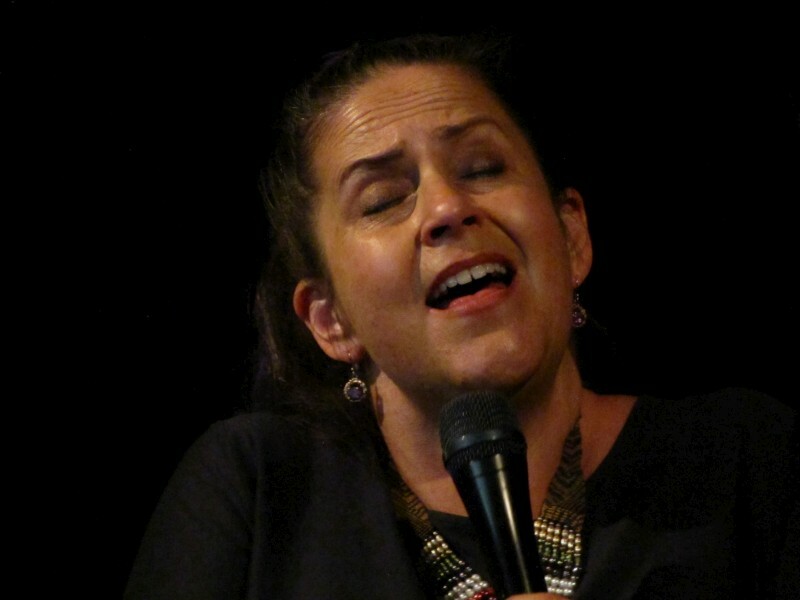 Or the quicklines of John Hendricks that she sang over rhythm changes. Or the glorious beauty of tunes like With a song in my heart. She talked of writing songs, but retreating in awareness of the grand collection of the American songbook. I understand. 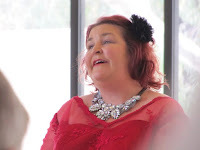 Or about the song written by Ziggy Elmand and Johnny Mercer, And the angels sing, which she also sang. What a joyous thing of innocent beauty! Perhaps out of place but not unwelcomed was Cold Chisel's Forever now: another great song, but just not American songbook material. Nice to see the crossover and the Australian presence. Then the chatter about Disney princess tunes. It's not something I know anything of (my kids were boys): she sang Upon a dream from Sleeping Beauty, a modern composition in songbook style. A slow take on Caravan; even a final take on There will never be another you. But such a concert! A small but intimate audience following closely. I often wonder about people walking by Smiths when these stunning jazz musicians are performing. How can they pass by? Not sure I could. This was a true stunner. 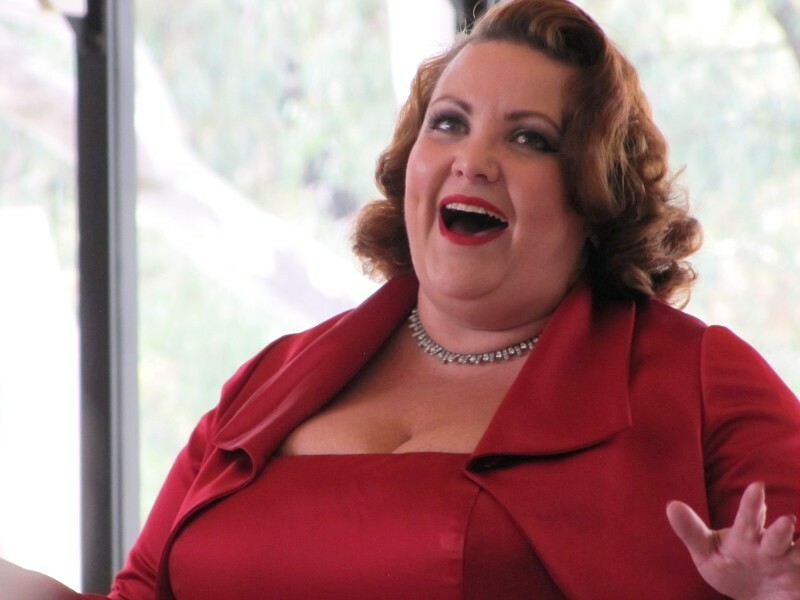 One week with Jonathan Zwartz and Michelle Nicolle, infrequent visitors from big smokes, just shows me how Canberra jazz has tanked over recent years. Michelle Nicolle (vocals) led a band with Geoff Hughes (guitar), Tom Lee (bass) and Ronny Ferella (drums) at Smiths to launch her new CD, A flower is a lovesome thing. 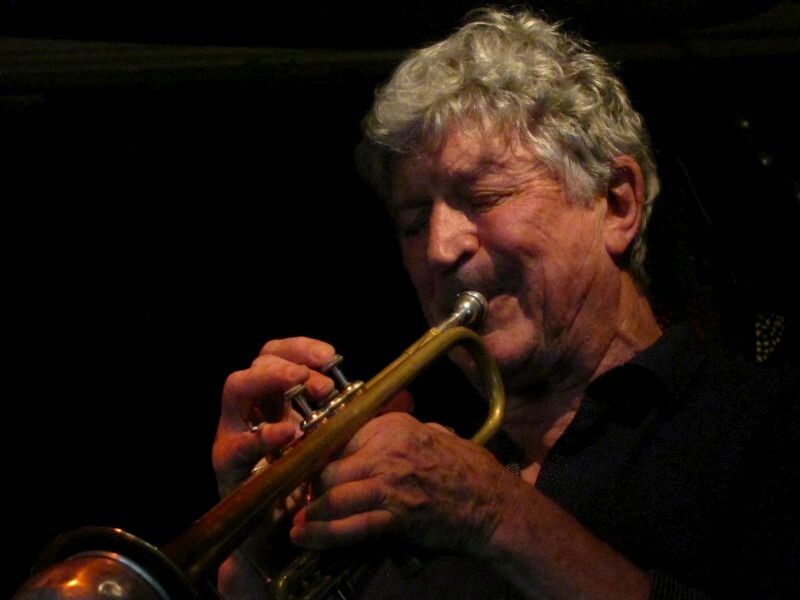 Miroslav Bukovsky (trumpet, flugelhorn) sat in for some tunes. It was an afternoon of two concerts and how different can two concerts be? 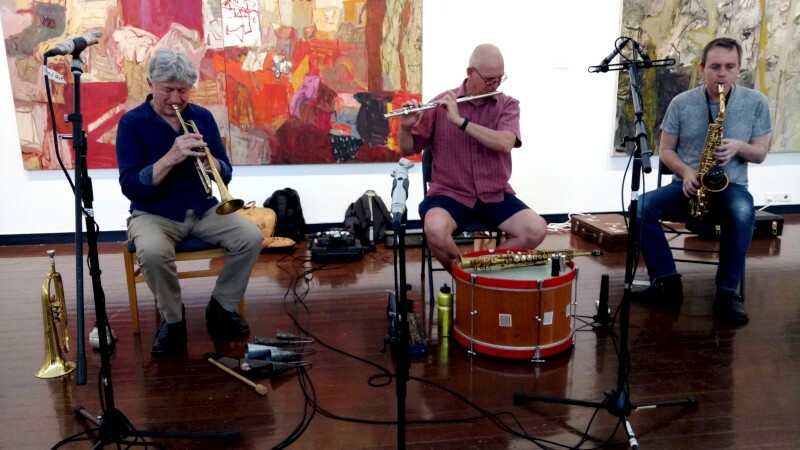 First up was free improv at the suitably live Drill Hall Gallery with Richard Johnson and Miroslav Bukovsky with Rhys Butler sitting in for the shorter second set. It's an interesting combination. Miro as the more melodic player led Richard to play melody as I've never noticed from Richard before; later Richard led Miro to play clicks and pops as he will on these occasions. I hadn't noticed Richard playing a flute body with sax mouthpiece before, but it worked a treat, sharp with tack-like valves and effective tonality. Miro moved through trumpet and flugelhorn and percussion; Richard also played sax, often into a drum skin, with and without mouthpiece. I found this a particularly successful outing in the open, free, unplanned style. The second set was shorter, with Rhys on alto mostly playing various noises, long notes, clicks and the like. The aircon was a problem with perceptible background hiss against the quieter parts: apparently it can't be turned off. But a very successful outing for an appreciative audience. 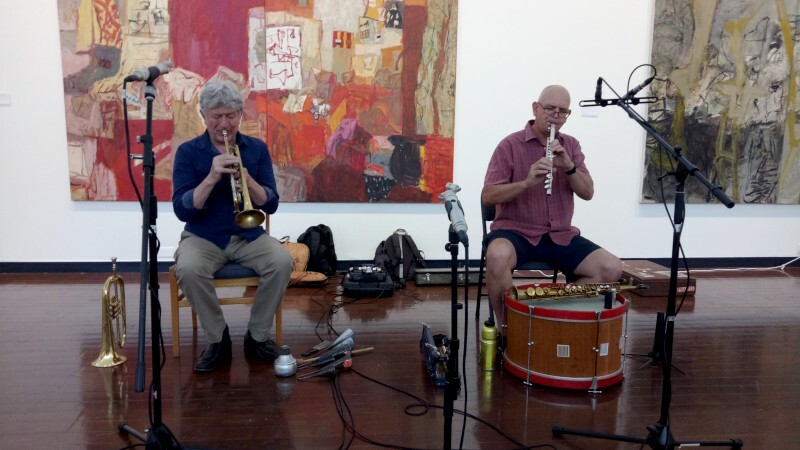 Richard Johnson (soprano, flute) played free improv with Miroslav Bukovsky (trumpet, flugelhorn, percussion) at the Drill Hall Gallery. Rhys Butler (alto) sat in for the second set. 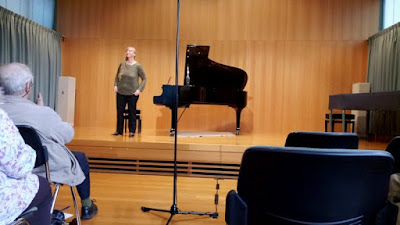 The concert was in the context of an exhibition by Elisabeth Cummings. The Foray Quintet was formed at a music camp to play Fauré but times change and people move, especially after tertiary training. 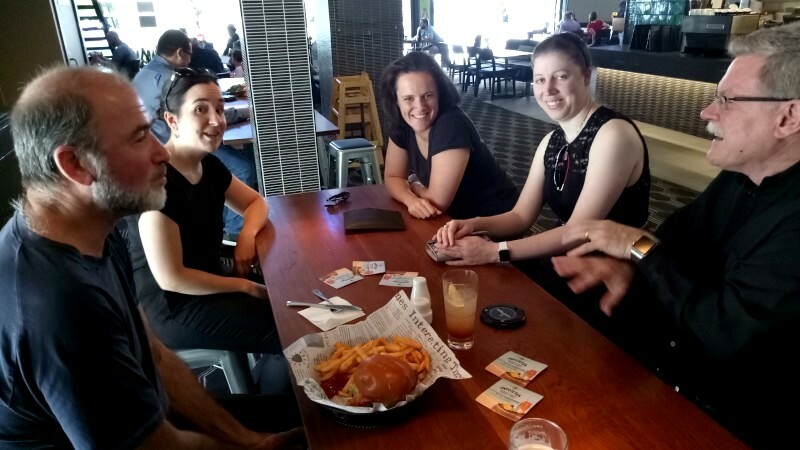 They are now spread from Sydney through Canberra to Melbourne, so getting together is not easy call. Their preparation was solo practice and a few weekends together and the music was challenging, but what a gig! This was the first of an East Coast tour. The music was one Fauré, his Piano Quartet Cmin Op.15, an early work, along with a world premiere, James Madsen Piano trio "A quiet fanfare", and a work of immense action and plenty of technical challenges, Erich Korngold Piano quintet Emaj Op.15. Korngold is known as a film scorer, and I could just imagine cartoon spills and chases in his music. Kimberley suggested he put all his ideas together and there were certainly lots of ideas splashing one over the other, but it seemed to set together pretty well like a showground ride, all quick twists, unexpected and exhilarating. Before playing, they demonstrated 6 bars with various complexities, glissando, pizzicato, extreme registers, dissonance, trills, but when that segment popped up, it was surrounded by more, not least artificial harmonic glissandos and chromatics. Exhilarating. Even the quieter, slower second movement had the ring of film, dramatic, emotional, immediate. Despite his film-score reputation, Korngold was an admirer of Mahler and the like. According to Kimberley, this was the most difficult and satisfying piece the quintet has played. And for the Madsen trio, I was surprised it had sat on a shelf two years before its premiere (it's always a frisson to attend a world premiere). I liked it, through rolling chords on piano with attractive melody passed effectively between violin and cello, then to a middle of doubt or questioning or uncertainty, then to return to the daily grind of chords and melody. Satisfying. And the outfit was great, attacking the Fauré with ease, comfortable time, good pitch. The Korngold was more a challenge, but played with relish and chops and some good humour around the most tricky bits. Very well done and a seriously interesting program. 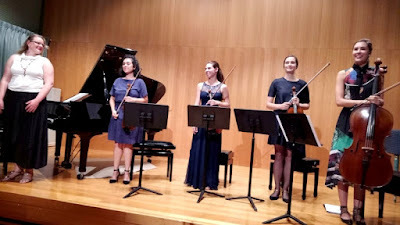 The Foray Quintet performed Madsen, Fauré and Korngold at Wesley. Foray comprised Elyane de Fontenay and Anna Murakawa (violins), Sarina Walter (viola), Anneliese McGee-Collett (cello) and Kimberley Steele (piano). Madness, perhaps, but for a long time I've wanted to play with Musica da Camera and Juliet needed a year off, and well, so it goes. Too busy but too good an opportunity to turn down. 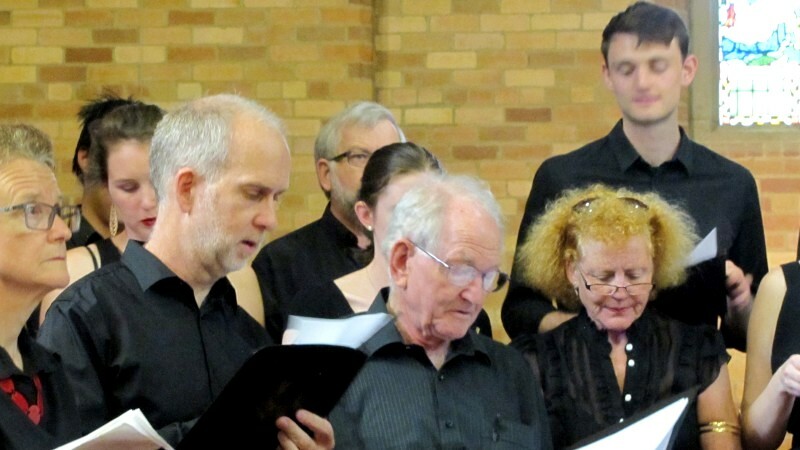 We are currently preparing for two concerts, one baroque, another of favourites, but even so we wouldn't normally be in concert black at rehearsal. This was also a photoshoot. So, portraits and groups shots and candid shots while playing. I have yet to see any pics. We joke that they will be ACO-like, all po-mo new-millenium cool. Perhaps not, but it was fun nonetheless. And it's a great little string orchestra (~20 players) with a challenging repertoire and a long history (formed 1979) and invited conductors for the educational value. 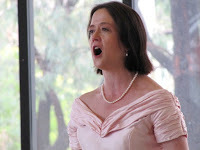 The baroque concert will be under Bianca Porcheddu of Australian Baroque Orchestra. 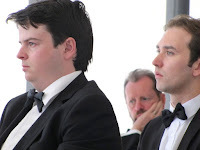 The Favourites concert (Elgar, Bach, Dvorak, Mozart, etc) is an added concert with members as conductors. 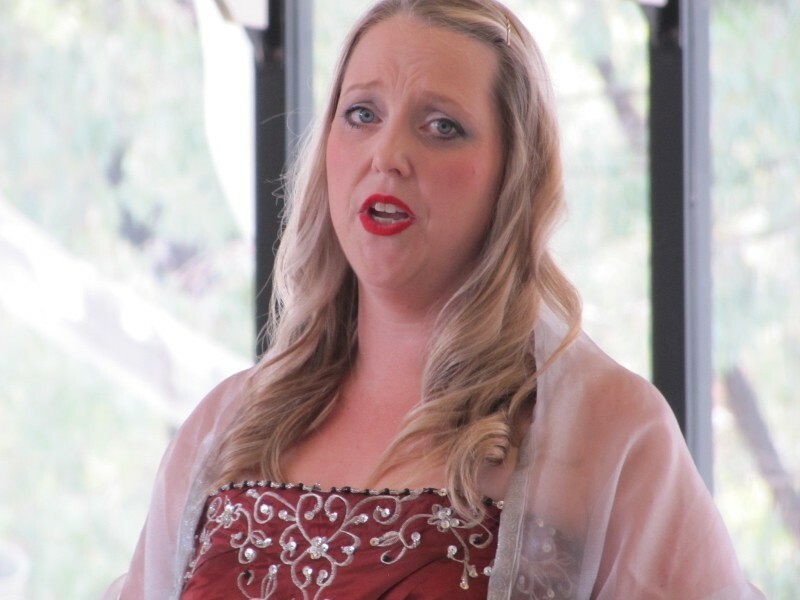 This is also a touring outfit, usually playing its concerts in Canberra and a local country town over one weekend. What pleasure to play with MdC. All too little known but a local gem. 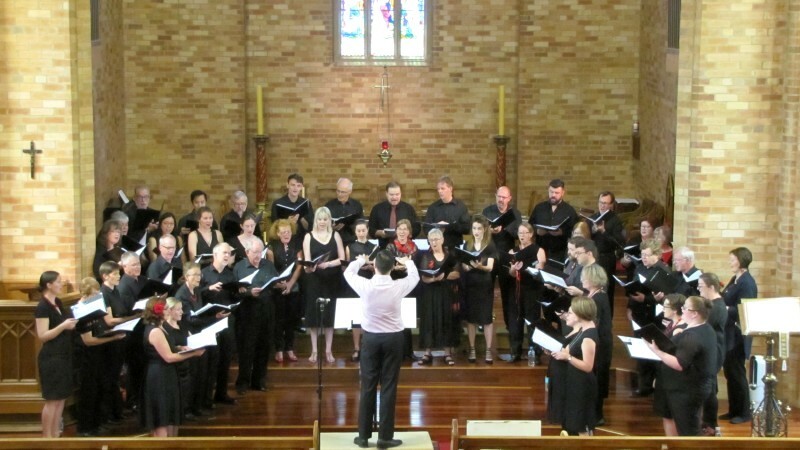 The Canberra Baroque concert is 3pm 6 May, Holy Covenant Church, Cook. 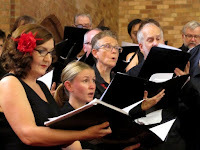 Musica da Camera is a string orchestra in Canberra. 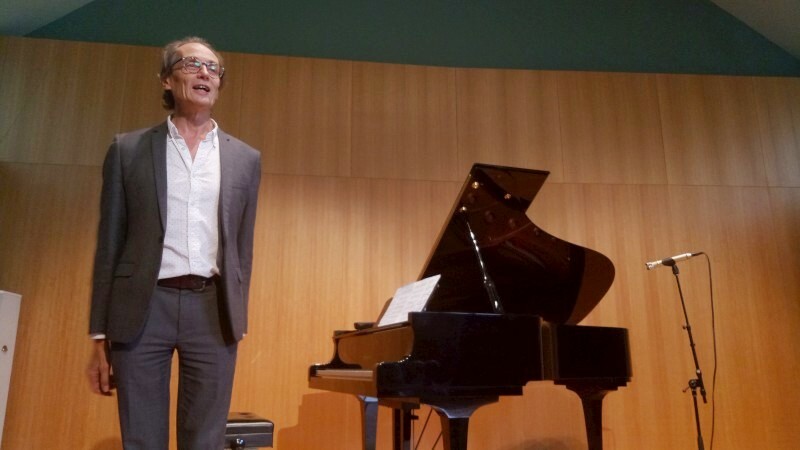 I remain in awe of Roland Peelman and his intelligence and emotionally connected, informative concerts. 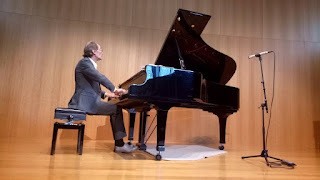 It amused me when he started to play a snippet of Bach to demonstrate broken chords, then going on to describe them as in narrow position as against wide (or close/open) position as in Spin bird, the composition by Kate Moore that he was about to perform. Then he went on to play Kate's work, somewhat minimalist, regular but changing unexpectedly in harmony and placing of accents. A beautiful work that I found unexpected from Kate's pen. Then on to Erik Satie, with an opening about his revolutionary works, predating simplicity at the time of Wagner, using elegant chords and classical clarity, leading to Debussy and Ravel on the one hand, and later to Stravinsky and Roussel, each time predating the later composers by a decade. The work was his Sonatine bureaucratique, apt for performance here in Canberra and reportedly the only piece in the repertoire on bureaucracy. Also how Satie wrote text for the performer on the score, so the Allegro is about walking to work, the Andante about thoughts of promotion and salary, and the Vivache (a neologism from vivace and vache=cow) including the return home and hearing Clementi in the background. A lonely, quirky, troubled man but a revolutionary portent. Then to finish on Schumann's Kinderszenen=Scenes from childhood. This was the full 13 tunes, mostly run up together, intriguingly picturing the life of a child, bookended with thoughts of adults. Delightful, deliciously played and a significant emotional commitment. It was telling to watch Roland's quietness after this piece as a measure of his involvement in the performance. I could only smile and appreciate the dignity. 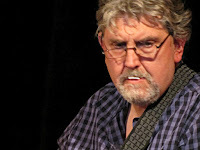 Here is a musician of great intelligence and commitment and readiness to share. A telling concert from a musician I hold in great esteem. Roland Peelman (piano) performed Kate Moore, Erik Satie and Robert Schumann at Wesley. Chris said it was like listening to a band in a studio and it was. Jonathan Zwartz had brought his sextet to Canberra to play for Geoff Page's series at the Gods and the music was so relaxed and easy but virtuosic, distilled, crystal clear but inventive, exploratory. All the lines just seemed so perfect, so apt, but never trite; perfectly expected after they were played, but wildly inventively conceived before they were played. And with surging rhythms that were busy but settled, malleable but sturdy. Jonathan himself was all over the bass, smiling at the intensity, firmly in the pocket, never losing the essence of the groove, but moving through and around it with wonderful playfulness. 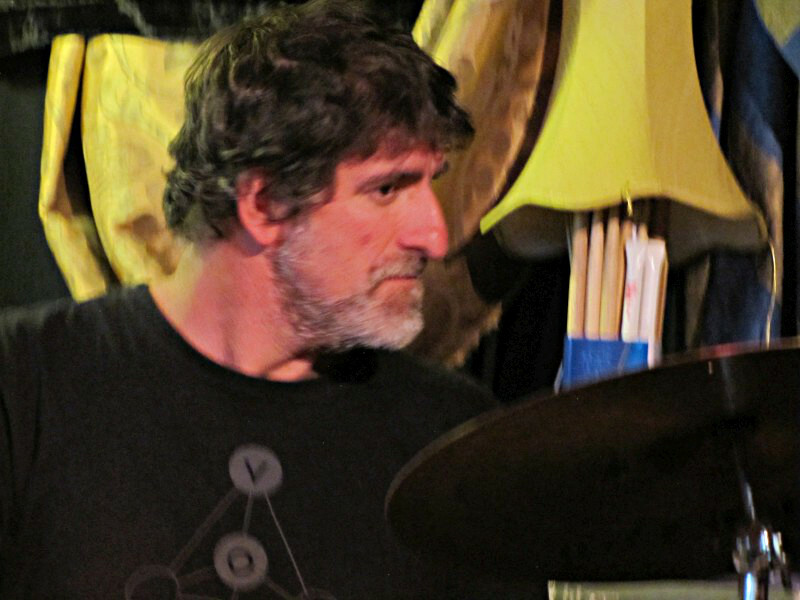 Along with long-term drummer offsider, Hamish, rock solid times (he preceded several tunes with a few clave clacks on a metronome to settle the time), intriguing grooves and ready for the non-standard, like one tune played fully with hands not sticks, or one with not a kick amongst it, and the apt changes under solos. 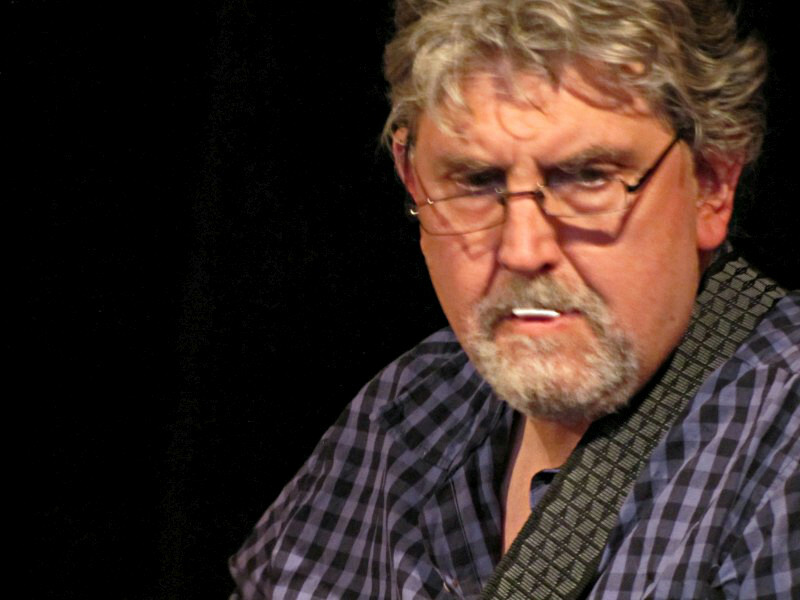 Matt was all studied Rhodes intrigue, ringing chords, neat fills and unpretentious solos. And the solos of Ben and the two horns, Michael and Phil, stunned me first up with thei r similarly light, lithe phrasing and varying attacks, in Ben's case, toying with picking and hammer-ons and the like. They played on somewhat that way, immensely discursive and investigative. I was floored by one trumpet solo from Phil, all melody and long, long phrases and chromatics then realised there was more, and under such control, a trumpet that merged imperceptively with tenor, could blat, but would so easily whisper. Not easy on that instrument. And the feel were all so defined, just right. That's also why I thought of the studio, where seasoned players can spell a tune with unrelenting clarity. And also, like a studio, they were playing without rehearsal. When Jonathan was giving instructions before one tune, they joked this was their rehearsal. And the tunes were diverse. They'd started with Seahorse, in triple time, with spritely melody. Then Milton, in honour of Milton Nascimento. Then a ballad called Billy. Then Scando, with a delicious Birth of the Cool-like walk. Then Soul sing, after a Donny Hathaway song. Jonathan commented that times are hard for musos, so "it's like a political statement just to get up and play". But they were enjoying it. Jonathan had a wide smile on his face at their superbly satisfying sounds. 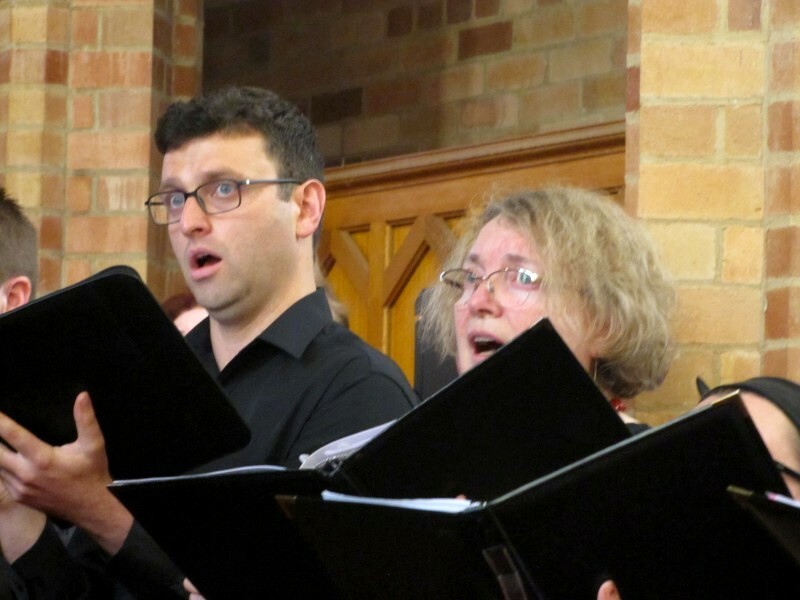 Then a second set, starting with a jungle bop and finishing with a pair, one openly beautiful, introduced as "like a hymn", and a bouncy tune to end. It's not often I've heard such precision and distillation of late or perhaps ever. A stunningly impressive outing. Need I say I was in awe. 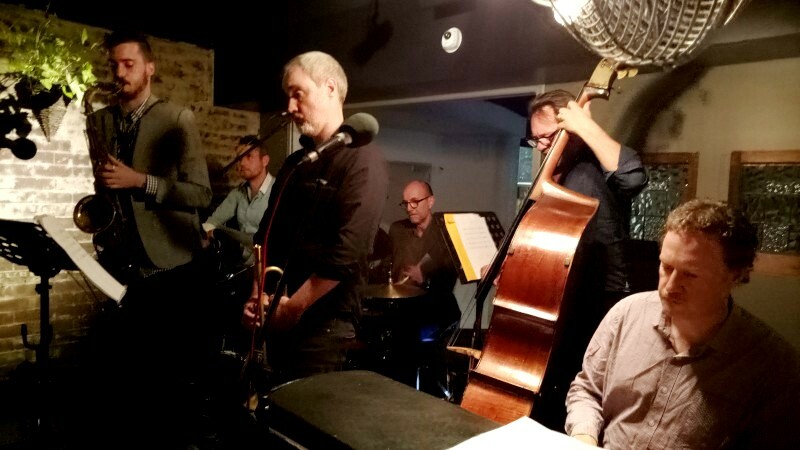 Jonathan Zwartz (bass) led his sextet comprising Michael Avgenicos (tenor), Phil Slater (trumpet), Ben Hauptmann (guitar), Matt McMahon (Rhodes) and Hamish Stuart (drums) at the Gods. 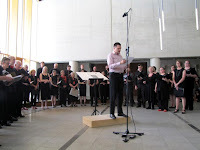 Igitur nos did a double act concert of music of Thomas Tallis. It was just a short concert, but interestingly repeated with just a bbreak of an hour so to travel between venues. 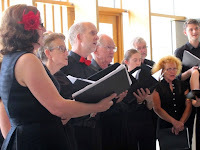 The first was at St Paul's Manuka, a church setting fitting the period and the dignified choral style. The second was the foyer at the National Portrait Gallery. Widely different: modern, square, timber and glass and cement. But to talk of this as a duo is inadequate. 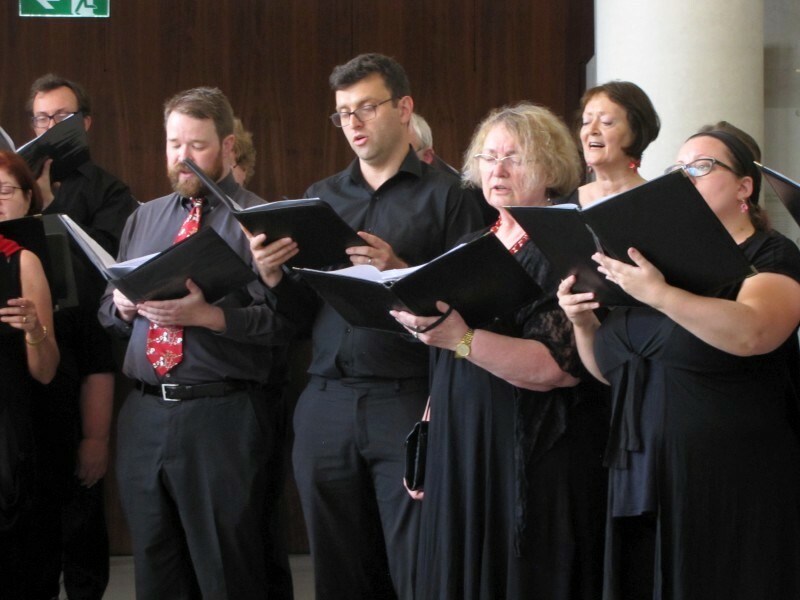 The main work was Spem in Alium sung by eight choirs of five parts. So think 8 not 2. 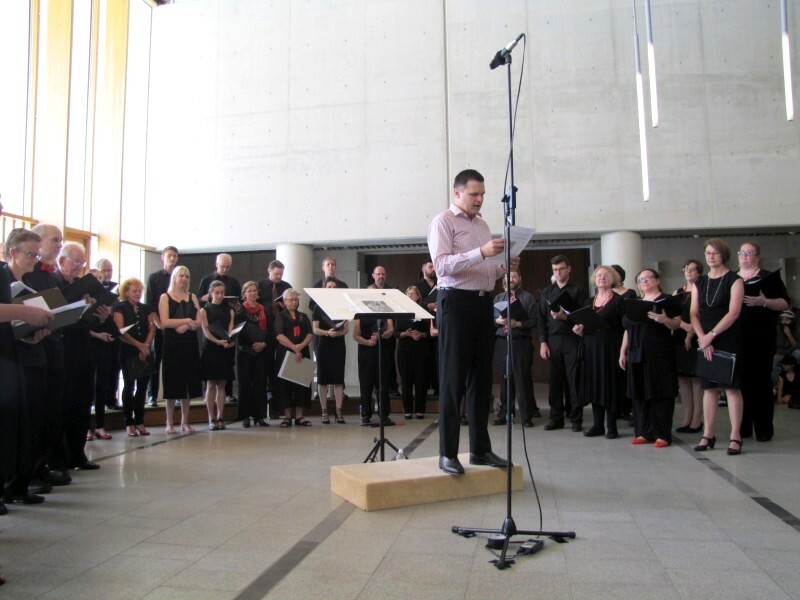 On the day, Igitur nos was slightly larger again, with 46-or-so singers and musical director Matthew out front conducting. Most presumably went to hear SinA, although the rest of the program was beautiful and delicate. 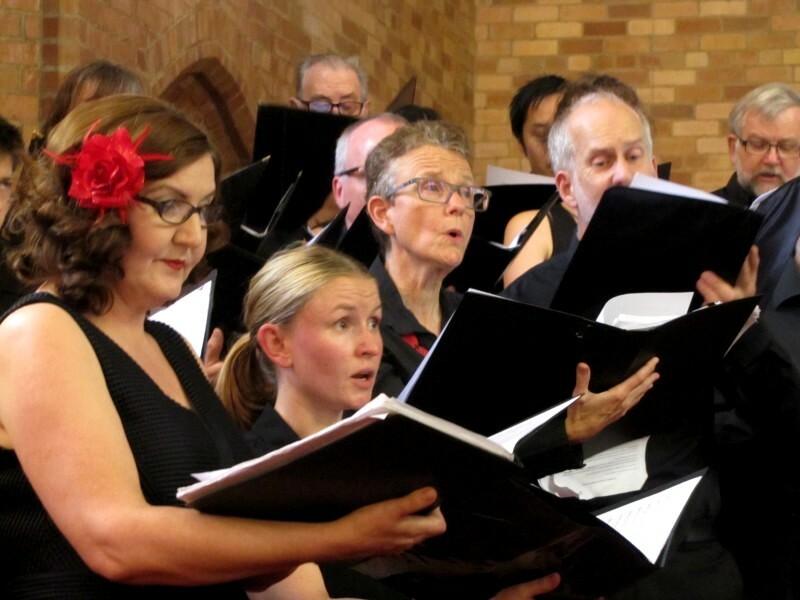 But SinA is renowned and complex, with the singing moving from left-stage to right, choirs 1/2 through 3/4, 5/6 to 7/8 and back again and at various times in tutti mode or otherwise merged. 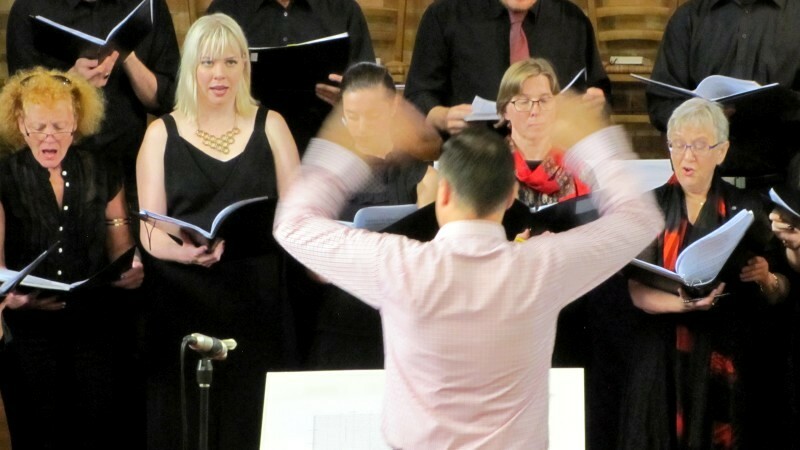 Sometimes, simple voices, perhaps a little unbalanced; sometimes great masses of singing. It's a work to hold in awe, but also to hear frequently to understand. The other works were simpler, presumably SATB or thereabouts, If ye love me, Verily verily, various psalm tunes, Locquanbantur, some personal, some religious. It was a stunning satisfying outing, and especially memorable for the repeat performance. I found I prefered the space and the performance of the NPG. I walked after with one of the singers and she confirmed that: more room, less interference, so singers had heard new things. But it's also the warmup and slight exhaustion of a repeat performance in short time. That settles and brings out emotional sturdiness and I thought it showed here. A memorable pairing. 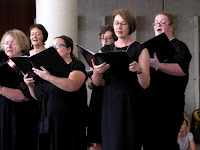 Igitur nos, under Matthew Stuckings (conductor, musical director), performed the music of Thomas Tallis, including Spem in Alium, at St Paul's Manuka and the National Portrait Gallery foyer. Muse is a civilised place: food, wine, books. A decent grand piano in the corner, a sophisticated staff and compliant atmosphere. I sat in again with Richard, and this time with James. So good to play standards all night for a restaurant scene. Lively but also settled. I play here with no amplification, but it carries, and bows for louder solos. Also, nice to play a drummerless format for a change, with the demands on your own time but also openness it allows. Not that I don't love drums. Just different, horses for courses, ask Dirk. And interesting beers and decent wines. The world is a great place for a while as its health is forgotten, temporarily. Thanks to all. Richard Manderson (sax), James Woodman (piano) and Eric Pozza (bass) played Muse restaurant. Too dark for a pic with a mobile phone but this joint was jumping. It's Molly's, a discrete basement whisky bar. 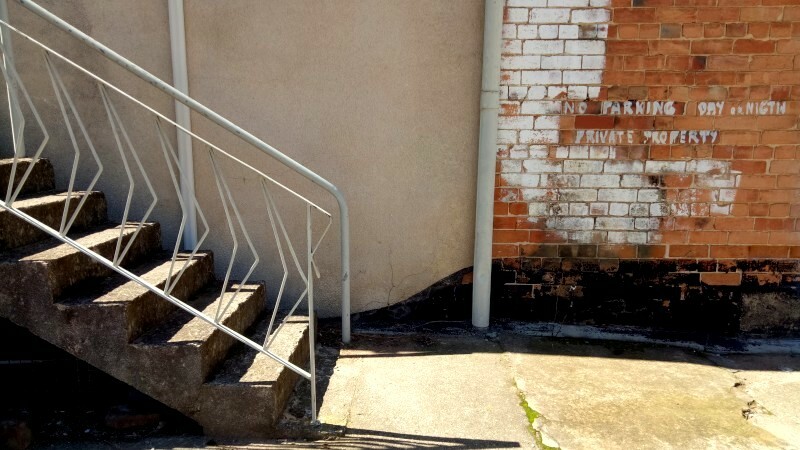 Discrete enough that it has no sign, just a weak old-styled light above a wooden door, opening onto a staircase. Well, not so discrete that it has no Facebook or website, but nonetheless, discrete. 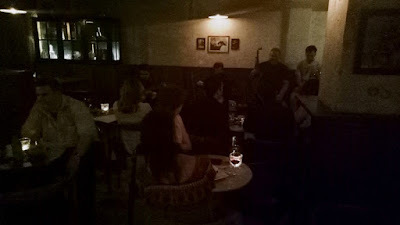 Molly's has jazz every Tuesday night, 7-10pm. I went to check out AFATM, the long standing and renowned local band, As Famous As The Moon, Dirk, Graham and Lachlan, with an American big band mate of Dirk's sitting in on trom. I only caught a little, but this was long solos and firm swing and glorious standards. And a busy bar and milling people. It's an oddly noisy little downstairs hole. Check it out. As Famous As The Moon are Dirk Zeylmans (tenor), Graham Monger (guitar) and Lachlan Coventry (guitar, bass). They played at Molly's. What is this? 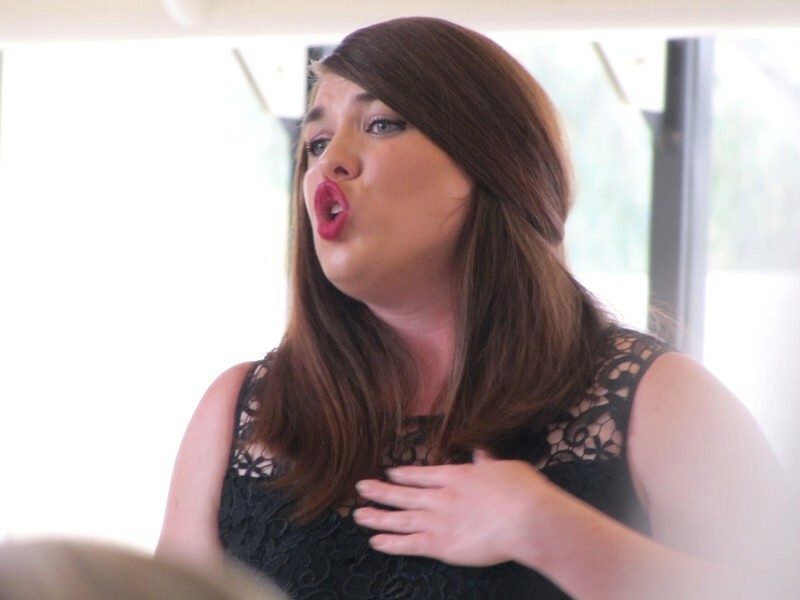 Me, opera? Again? It's a surprise to me too but I enjoyed it well enough. Canberra Opera is a community company. 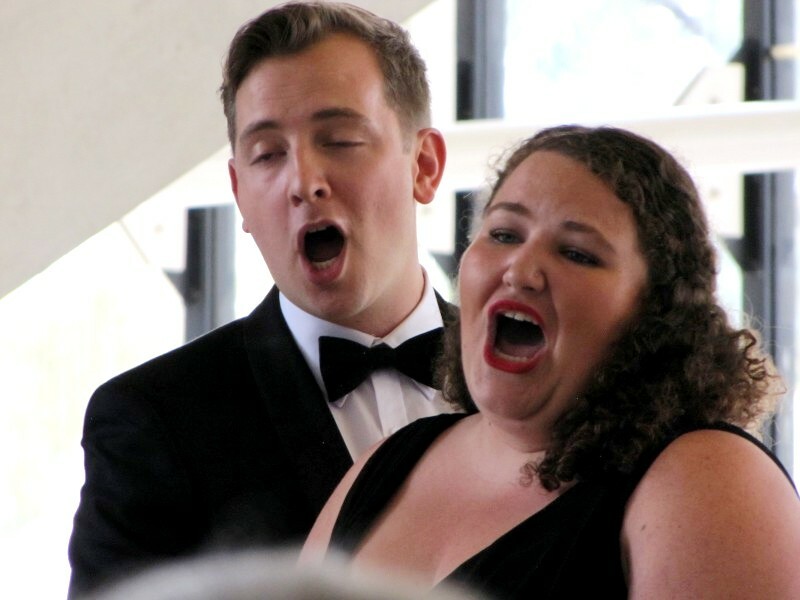 They performed at the High Court prior to their upcoming season of Die Fledermaus and they were good and they were entertaining. 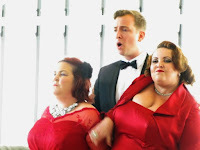 This was mostly a hot shot set of arias, so not the whole story, with piano accompaniment, so not the full orchestral treatment, but the voices were good and there was a sense of drama and performance even if often enough just tongue-in-cheek. Opera is different in this respect from other singing: it's dramatic and it shows even in these snippets. This was a good 90 minutes, from Carmen, Handel, Tannhauser, Don Giovanni, Donizetti, Gounod, Tosca and the like, and a collection of tunes to finish up from the upcoming Die Fledermaus. There were some jokey love songs and one with two women vying for one mild man and a champagne chorus with empty glasses as props (the thought as there) and a few more serious numbers, not least a song from Rachmaninov. There were a string of singers, I guess mostly tenors and sopranos, and one piano backing the lot. 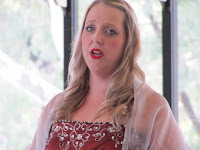 The audience is keen at the High Court and the singing was vibrant and pleasurable and often fun, so this was a pleasurable outing, and it's so great to see our local amateur opera company is working away. 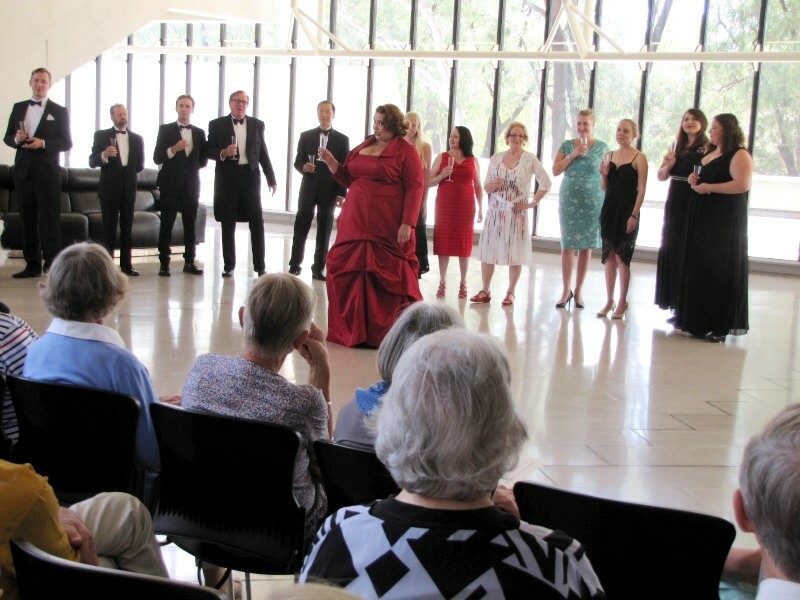 Congrats to Opera Canberra. 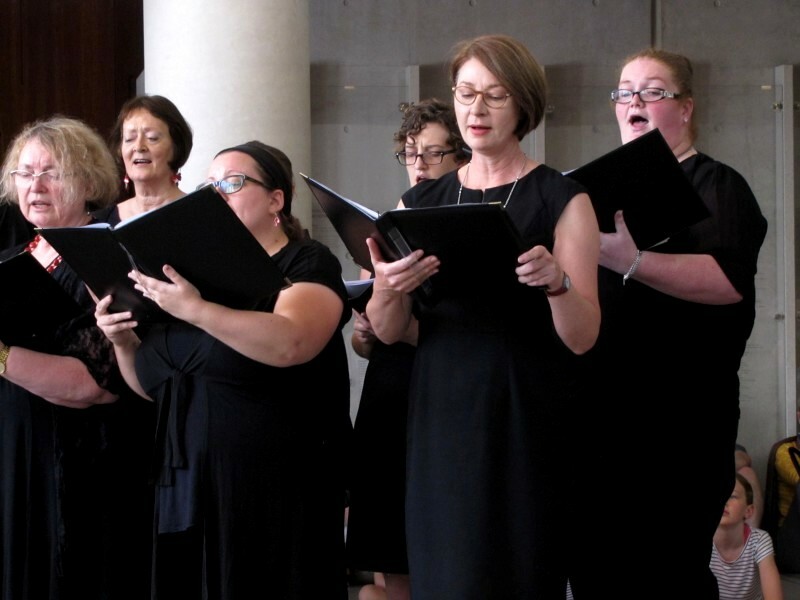 Opera Canberra singers included the Chorus plus Lachlan McIntyre, Karyn Tisdell, Elisha Holley, Catherine Martin, Stephanie McAlister, Andrew Barron, Madeline Anderson and Keren Dalzell. Peter Smith was host.